A new work in English about celebrated Soviet painter Viktor Popkov aims to shed light on his textbook image. Viktor Popkov was one of the most celebrated Soviet artists during Krushschev’s Thaw. Perhaps it is for this reason – that he was recognized and not considered an underground artist – that he is less well known, and less appreciated outside Russia than many of his peers. “Viktor Popkov: Russian Painter of Genius” (Unicorn Press, 2013), is the first book about the artist published outside Russia. 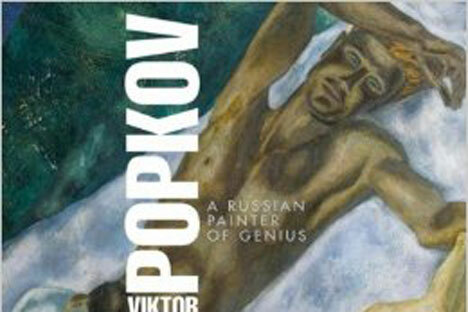 Popkov was born in 1932 and tragically shot dead on a Moscow street in 1974, when he mistook a courier for a cab. Kozorezenko’s huge and beautiful tome takes readers chronologically through Popkov’s diverse, stylistic periods, from 1950s Socialist Realism, through the “Severe” or “Austere Style” which he helped create in the 1960s, to his late “Philosophical-Romantic” phase. There is a fascinating progression from the dynamism of his early works to more contemplative figures. “The Team is Resting” (1965), which became the artistic symbol of the 2012 World Chess Championship in Moscow, uses warm, autumnal colors to show a group of workers, sprawled and sitting, reading and playing chess. The painting on the book’s cover has similar pensive power: contemporary critics were scathing about “Summer, July” (1969), not appreciating what Kozorezenko calls its “metaphorical dimension”. “Spring at the Depot” (1958) seems poised between the glorified heroics of Socialist Realism and the more profound later works. Socialist Realism, the official style of Soviet art from the 1930s to 1950s, was characteristically optimistic; paintings of this period are filled with “the greatness of the Soviet people … painted in light, bright tones…,” Kozorezenko said. The “Builders of the Bratsk” (1960) is an icon of this style. The workers stand or crouch against an uncompromising, dark background, a group of individuals with their own emotions, but a common goal. The Tretyakov Gallery bought the painting when Popkov was 28 years old. Popkov is one of Andrey Filatov’s favorite artists and the Filatov Family Art Fund has one of the world’s largest collections of his works. Andrey Filatov, co-owner of N-Trans, founded the Filatov Fund last year, with the aim of collecting Soviet works of art from around the world bringing them to a global audience. The paintings in Filatov’s growing collection range from ideological icons like Vladimir Serov’s “Lenin Proclaims Soviet Power” to atmospheric still lives and landscapes. He plans, initially, to add a dozen new works each year. The book is the first in a series published by the fund. There are plans for a book about the Russian-American painter, Nikolai Fechin, next year and for exhibitions of both Popkov and Fechin. The fund sponsored a display of Fechin’s work in Seattle, and added his “Taos Girl with Sunflowers” to the collection earlier this year. “The aim of the fund is to make the works of these Russian artists available to the public,” Filatov told RBTH.